For his years of quality sports reporting he is known as the dean of Kentucky sportswriters. 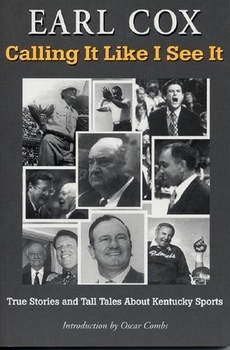 Calling It Like I See It, his first book, collects years of Cox's writing — in his typical brash, brassy and funny style — and documents scores of true stories and tall tales about all of Kentucky's legendary sports teams, events and personalities: University of Kentucky, University of Louisville, Cawood Ledford, Denny Crum, Rick Pitino, Joe B. Hall, Pete Rose, Bobby Knight, Ed Diddle, Blanton Collier, Ralph Beard, Wes Unseld and much more.